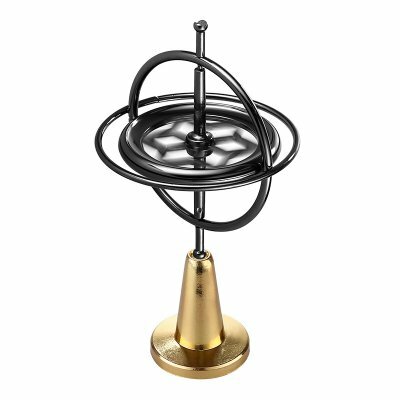 Successfully Added Gyro Spinner Desk Toy - Zinc Alloy Body, Release Stress, Anxiety, and Negative Thoughts to your Shopping Cart. This little mechanical gyro spinner is a great desk toy that helps you to release stress, anxiety, and negative thoughts. Additionally, it simply is a fun little gizmo that can entertain for hours in a row. With its zinc alloy body, this cheap gadget features a cool and durable design. It can be used in different ways that are sure to challenge you over and over again. Simply put the strings around your gyro spinner and try to make your desk toy spin and balance in different angels. While playing with this mechanical gyro spinner, all your stress, worries, and concern will be forgotten instantly. The effects of this desk toy gyroscope are sure to make you feel better and more relaxed – leaving an everlasting impression on its users. We will deliver random color black or gold. This desk toy comes with a 12 months warranty, brought to you by the leader in electronic devices as well as wholesale electronic gadgets..